So... a week or so ago I reviewed Gail Pan's newest book Patchwork Loves Embroidery Too and I promised I would post a progress photo of the embroidery I am doing from her book. As you can see, it is coming along, 'organic' lines and all. I am not using a hoop (sometimes I do, sometimes I don't - do not ask me why). I worked with the black first and, then, the darker 'honey'. I am adding lighter hues of the same color just for a change. I embroider at night because you know what I do during the day. I had misplaced my Beam and Read light and only found it after the black lines had been added. I did rip them and embroider them again. Again, they are less than perfect but, hey, if I wanted perfection I would ask Gail to do it for me, right? Speaking of perfect embroidery, this weekend, my husband and I were fixing a bookshelf which had collapsed under the weight of the 'few' quilting and embroidery books I have (!). 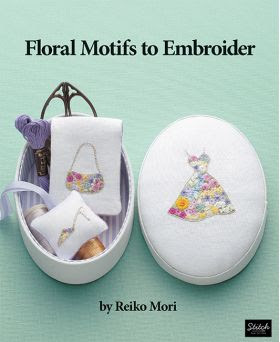 As I was organizing my precious collection of inspiration I found two books by Reiko Mori which were published by Stitch Publications LLC and are being distributed here in the US by Martingale. The first (above) is Elegant Embroidery. Photographs by Yoshikatsu Watanabe. Used with permission. 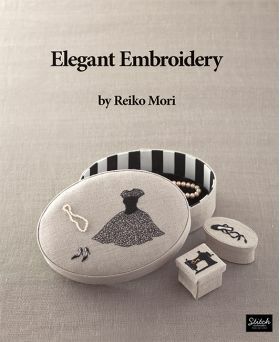 Reiko's book could not have had a better title! Her 3D designs are dainty, flawless, and enliven the projects they adorn. 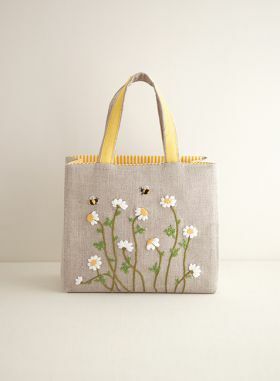 "Tote Bag 2", above, with Chamomile being tossed by a breeze and honeybees, is my favorite of the projects in this book. Her embroidery is full of movement, be it in the designs - walking porters, winter coats opened by the frigid air, ice skating children - or in the words: "vacation" and "holiday" for example. Yes, there is a faucet over the watering can on the zippered bag above! Reiko's designs are in a class of their own with unexpected details, expertly chosen colors, and amazing texture. All the notions she uses, the stitches she employs, and the diagrams illustrating project construction appear at the end of the book in a large section. The translation was well done so you should have no problem following along. 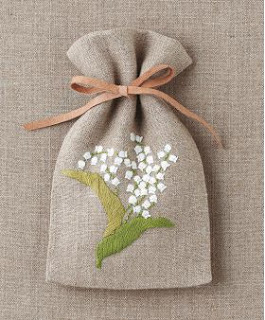 Floral Motifs to Embroider is filled with floral vignettes we can apply to our own projects. 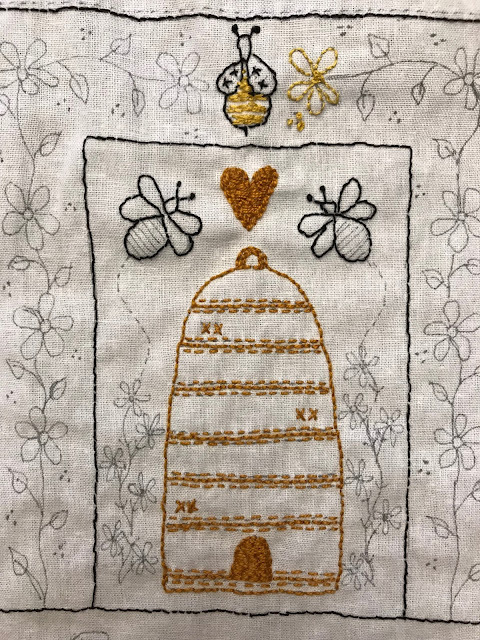 I recognized some Brazilian 3D embroidery stitches in her work, which took me on a trip down memory lane to the days when my mom used to hand embroider baby clothing for manufacturers in Brazil. Photographs by Akiko Oshima and Nobuhiko Honma. Used with permission. The floral motifs are gorgeous... You will find heavily embroidered or sparsely filled designs, each of which can turn a simple garment or gift bag, such as the one above, into an heirloom. Reiko's work 'pops' not only because of her use of 3D embroidery but also due to her use of other 3D elements stitched to the background such as dresses, kimonos, and veils. Yep, by now I am wondering if I should delete the photo of my work at the beginning of this post... However, I will leave it here to show you I am not afraid to venture into a less-traveled territory, and perhaps you may consider doing it, too! Reiko Mori's embroidery comes with her invitation for us to "open the door" of our hearts, "pick up a needle, and begin to stitch." Are you ready? 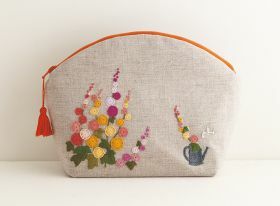 I think YOUR embroidery is wonderful. Why would you consider deleting that photo? Reiko's work is also fabulous. 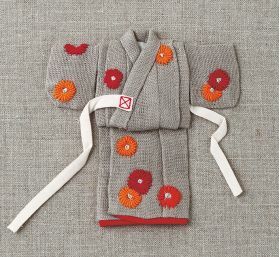 That kimono is just darling. Your embroidery looks amazing to me...don't even think of deleting it. 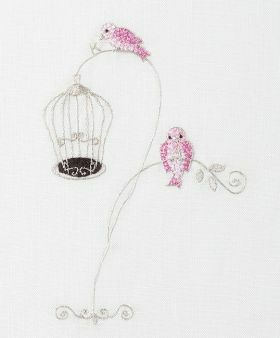 I pretty much can do one kind of embroidery stitch, so I'm envious of people who can do beautiful work like this. The little pink birds are darling!